Parotta Recipe (Tamilnadu Style ) was in my mind for a long time , only now I got a chance to post it. Parotta or porotta or barotta is a griddle fried road side Indian flat layered bread, popular in Tamilnadu and Kerala. They are made with all purpose flour (maida), sugar, salt, oil and water. This barotta / parotta is very close to my family and my father is a die-hard fan of parotta. Traveling down the memory lane, when I used to come home from college, I used to remember lot of food stalls in my neighborhood making parotta, the parotta masters meticulously making the dough, swirling and whipping the dough in the air was both entertaining to watch as well as appetising. Later when the sun sets, you could smell the warm toasty notes of fresh parotta hitting the Iron grill. 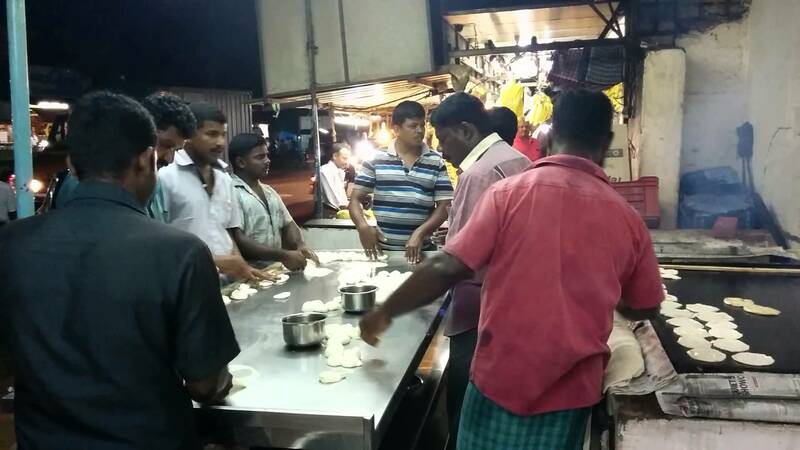 Besides the tantalizing smell, you could also hear the “tick-tick, clack-clack” sounds of masters making “kothu parotta“. The smell of salna, green chillies, parotta all being cooked in a cast iron grill salivates me even now 😆 😆 and sure was a feast to both eyes and ears. In places like Madurai, Dindugul in southern India to call parotta consumption as a way of life will not be an exaggeration. One simply cannot imagine, a night out /night life in these parts of the world without enjoying a plate of steamy, hot parotta with chalna / kurma & raita served in a plaintain leaf. These places usually are surrounded with parotta stalls and they serve food to hungry souls round the clock and the city never sleeps . Though this dish was very tasty to be had as a finger food, the large amount of oil used, made it little unhealthy. But the recipe for eggless parotta given below has tried to do justice to the taste of traditional parotta using less oil, and therefore a healthy recipe. Instead of maida (All purpose flour), you can use whole wheat flour. Properly made parottas are served with nice hot kurma or salna with eggs and raita is a dish to die for. Hope you guys try this and enjoy life 😎 😛 . Parotta Recipe (Vegetarian and Eggfree) is a popular street food in Tamilnadu. Making parotta at home is very simple and it tastes yummy with salna and raitha. In a bowl, add maida (All purpose flour), salt, sugar and oil. Mix well with hand. Add water slowly, mix well. The dough will be sticky. Place the dough on the working surface, knead it for 10 mins. Roll it into a smooth ball and cover it with a wet cloth and leave it for 30 mins. Knead it again for 5 mins and roll it again into a smooth ball and let it rest for another 30 mins. Divide the dough into equally sized balls. Roll the dough to a round shaped balls. Allow it to rest for 5 mins. Flatten the balls as thin using the rolling pin or using your palms and fingers to stretch out into a thin sheet. You have to make it super thin as much you can. The shape is not important. Apply a tsp of oil and flour, spread throughout the dough. Slowly lift the dough from one end and fold like saree pleats to the another end. Now rotate the dough slowly and make a spiral dough, tuck the end under the spiral. Apply oil and rest it for 5 mins. On the greased work surface, flatten the spiral dough to form a circle and roll it into a thick parotta using rolling pin or using your finger. Smear oil as you roll out. Now you can see the layers in the dough. Heat a cast iron pan, add oil and smear it with a wooden stick. Carefully place the parotta, add oil on both sides and cook until it turns golden brown colour on both sides. Once parotta are cooked, place 2-3 parotta on a working surface and beat the parotta on all sides with two hands. Now you can see different layers of parotta. It helps to open the layers of parotta. Prepare the rest of the parotta in the same way. 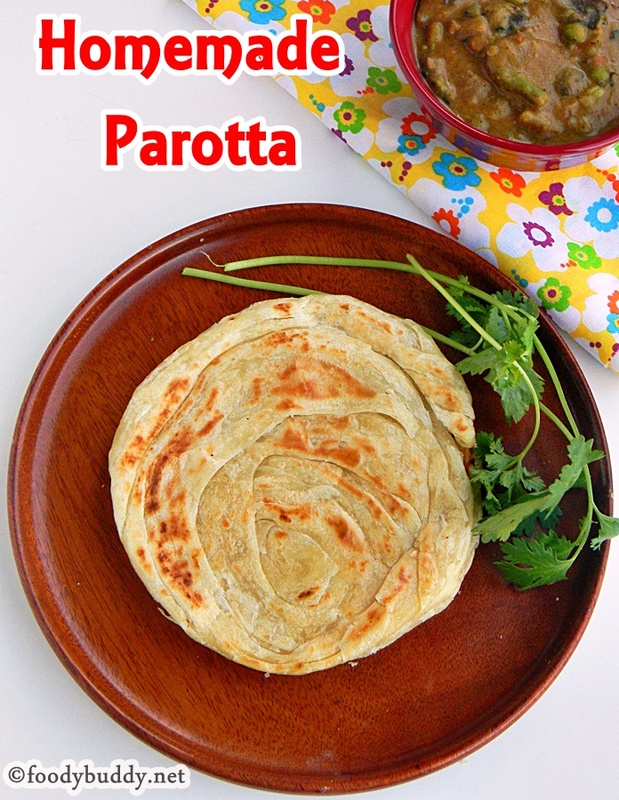 Hot, delicious parotta is ready to serve with vegetable salna or kurma and raita. You can use whole wheat flour instead of maida. Crushing the parotta in the end is important. More time the dough rest, the softer the parotta. Kneading the dough is very essential, so knead it for minimum 10 mins in every step. Adding sugar to the dough, gives a nice golden color to the parotta. 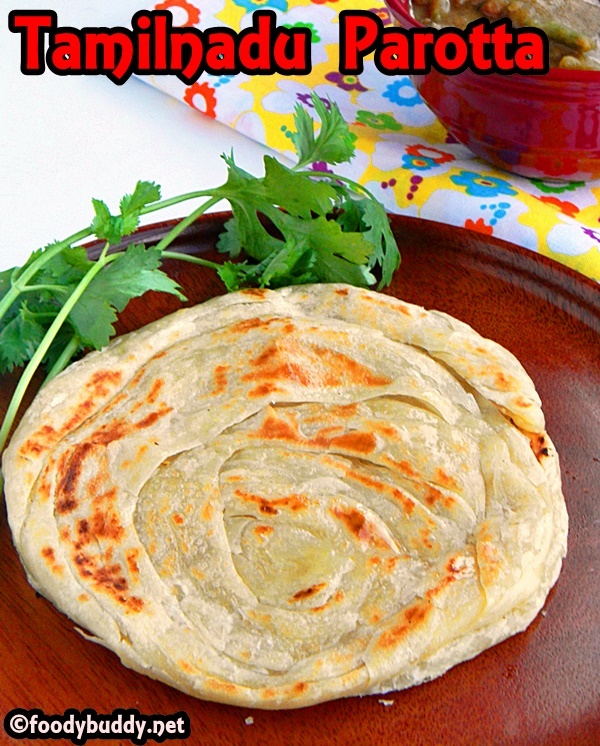 Using oil and flour to the rolled dough, gives flaky parotta. 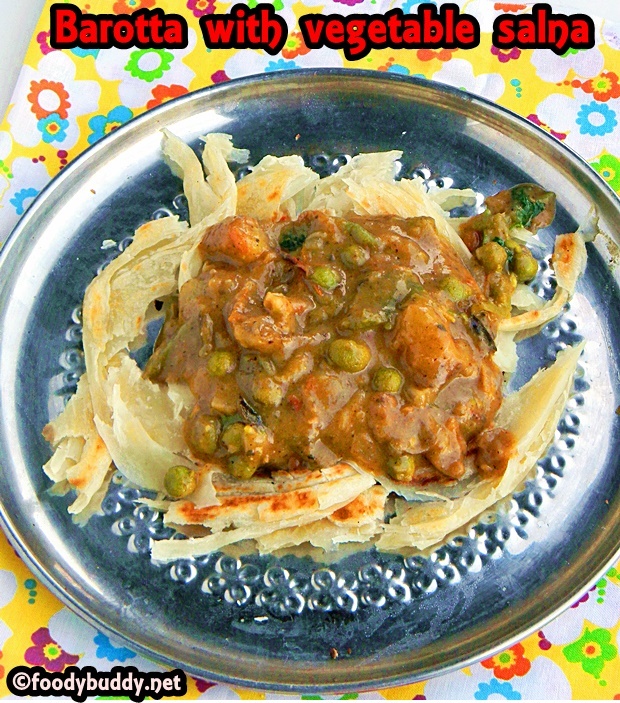 This entry was posted in dinner, South Indian Recipes, street food and tagged dinner recipe, parotta recipe, south indian, tamilnadu style parotta. my son’s most fav food.. lovely! I’ve never had parotta before, but it looks delicious! I love this bread and now I’m glad you’ve shared a recipe for it! The process reminds me a lot of Chinese shallot pancakes. lovely post! The video is really help to learn how to make parotta perfectly! Oh my, this sounds amazing! I love making my own breads, and I can imagine this one would be fantastic!